Saturday morning, eat a nice big breakfast, pack yourself a lunch, stick it in a backpack, and ride to BART. Helmets and water bottles (or Camelbacks) are mandatory. Spandex, a pump, and a spare inner-tube are highly encouraged. Click any image to see the google map page. 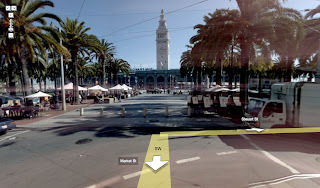 9:30AM: We will ride to the Blue & Gold Ticket Counter at Pier 41 (NOT pier 39). If you're driving, meet us at Pier 41 at 9:45AM. 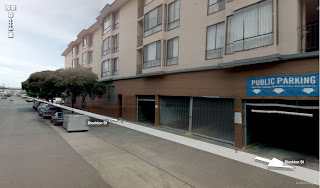 The cheapest parking lot (believe me, I know) in the area is on Stockton between North Point St. and Bay St. From there, you can ride a couple blocks to Pier 41. 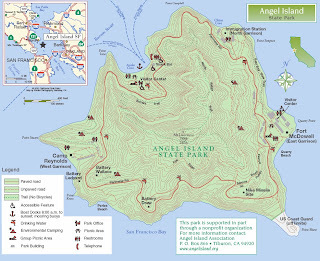 10:35AM: We will depart on the Blue & Gold Fleet ferry to Angel Island. There's only one boat, and it leaves at 10:35am. Round trip tickets cost $14.50 for adults, Children 6-12 are $8.50. Everybody will buy their own tickets at the ticket window when we arrive that morning. For the ride, there are two loops around the peak, one paved, and a smaller inner fire-road. I figure we can all do the big loop together. Those that have energy can do the inner loop a couple times. After that we'll break for a pic-nic lunch. 3:50PM: There's only one boat home. The ferry back to SF leaves at 3:50pm. 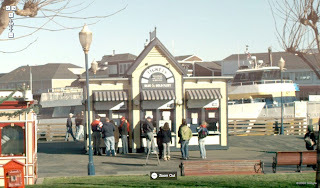 5:00PM: The ferry will have you back at Fisherman's wharf around 5pm. 5:30PM: If you need to ride back to BART, you can expect to be done with your day by 5:30PM. If people are interested, we can BBQ at my house after the ride. I'm 3 blocks from El Cerrito Plaza BART.